Looking how to trade CFDs? Follow these steps to get started. 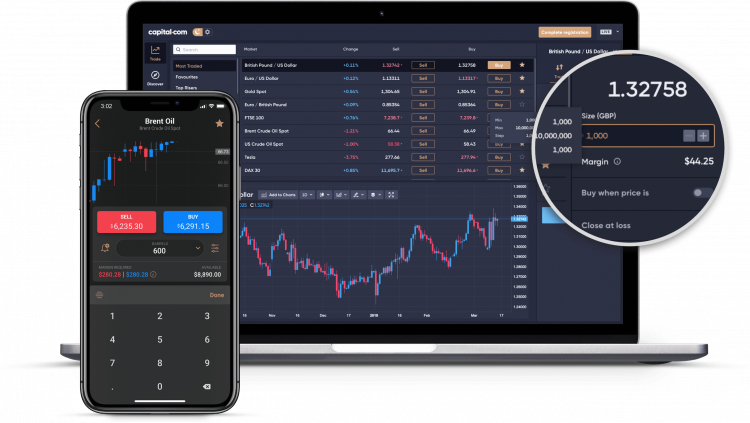 Many people new to trading often ask “how does CFD trading work?” A CFD is a derivative product that lets you trade whilst only putting up a fraction of the value of your trade, this is known as trading on margin. Trading on margin, or leveraged trading, gives greater exposure to global financial markets. Leverage trading involves only putting down a fraction of the value of your trade and essentially borrowing the remaining amount from your broker. This allows traders to open larger positions given their initial capital. Leverage trading can amplify your wins, but can also amplify your losses. When trading CFDs you do not own the underlying security. You simply buy or sell a contract depending whether you want to long or short a security. How CFD trading works: When you open a CFD position you select the number of contracts (i.e. trade size) you would like to buy or sell and your profit will rise in line with each point the market moves in your favour. If you think the price of an asset will appreciate, then you would open a long (buy) position and profit if the market moves in line with your expectations. Conversely, if you think the price of an asset will depreciation then you would open a short (sell) position and profit if the market moves in line with your expectations. Creating a CFD account with Capital.com is a simple and straightforward process, and will only take minutes to complete. First, you have to create an account using an email address and password. Then you have to provide proof of address and identity verification which can be done electronically. Finally, after this has been processed, all you need to do is fund your account in accordance with the minimum deposit. Once your have you account set up, the next step is to devise a trading plan for trading CFDs. A trading plan is a structured method for identifying and trading assets that considers various factors such as timeframe, propensity to risk and the investor’s objective. Contrary to popular belief, trading plans do not necessarily need to be pages long – they can simply be a comprehensive blueprint that has considered all essential factors. When devising a trading plan, you will consider: your motivation for trading, the time commitment you wish to make, trading goals, attitude to risk and risk management strategies, available capital, markets to trade and preferred trading strategies. Once you have outlined why you want to start trading and how much time you have to commit to this, this will shape your goals. Be realistic with your goals. If you plan to commit a few hours a week, then don’t expect to make vast sums of money within a short timeframe; having unrealistic goals will encourage you to make riskier trades in a given timeframe. It is crucial to determine how much you are willing to risk as well as your attitude to risk in order to formulate appropriate risk management strategies. If you are risk averse, then you will be looking for opportunities with lower risk-to-reward (R-R) ratios. Once you have considered risk management, you need to decide what asset classes you are going to trade, and this can be somewhat influenced by your goals. For instance, if you are looking for slow and steady growth, asset classes with higher volatility should form a proportionally small part of your portfolio. It is strongly recommended to diversify across all asset classes to increase the likelihood of good trading opportunities, as well as to mitigate risk. Trading the trend. Trend trading is a trading strategy that attempts to capture financial gains through the analysis of an asset's momentum in a particular direction. Day trading. Capitalise on short-term opportunities that are triggered by a variety of stimulus from developing news or emerging trends. With day trading all positions are closed by the end of the day. Scalping. Scalp trading is a type of short-term trading that aims to make small and regular profits from numerous trades. Scalp trading tends to generate the smallest gains per each successful trade, when compared to other types of trading. It tends to be based on extensive technical analysis. Find out more about trading strategies and different techniques here. 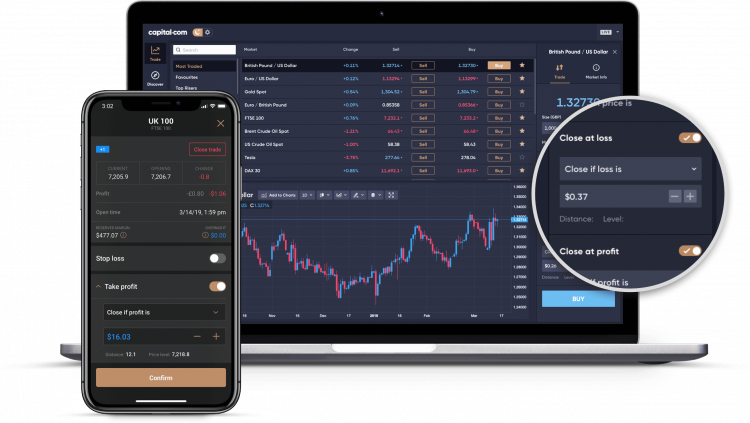 Now that you have formulated your trading plan, use Capital.com’s award-winning platform to browse through 2,000 financial instruments to find opportunities within a variety of different markets. We offer markets across the following asset classes: shares, indices, forex pairs, commodities and cryptocurrencies. Within our platform, we have a live news feed that will keep you up-to-date with all the latest movements in the markets, helping you to identify trading opportunities in real terms. With CFD trading, you have the option to open long and short positions, meaning you can spot opportunities in rising or falling markets. Within our mobile platform you will find the watchlist under the ‘trade’ section. The watchlist consists of two parts. Firstly, it shows the extensive list of instruments we offer, accompanied with useful filters to help you find the exact market you’re looking for. These filters include Major Indices and Popular Tech German Stocks for instance. Once you tap on an instrument you’ll become familiar with the other part of our watchlist that illustrates security prices dynamically in the form of real-time charts. You will see a graph, relevant news and buy-sell options for the instrument. Once you’ve spot an opportunity in the market and you’re ready to trade, open the position in accordance with where you think the market will go. From this point, your profit or loss will move in line with the underlying asset price in real time. 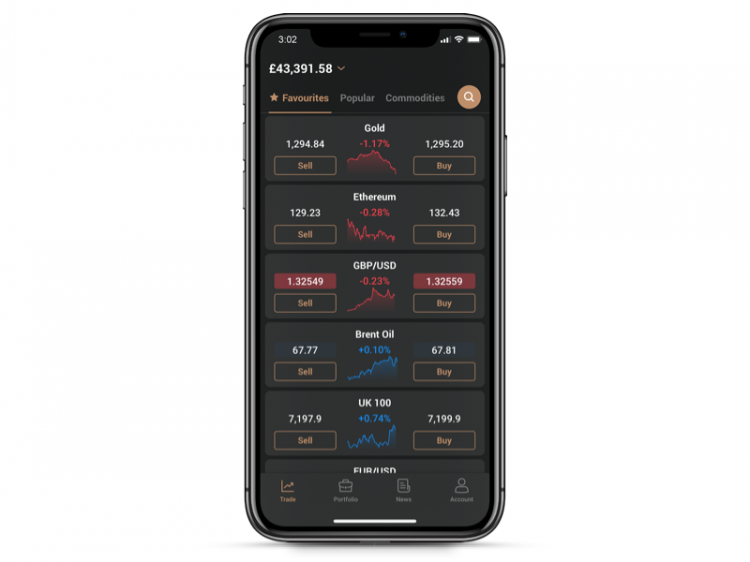 You’ll be able to monitor all positions that you have opened within the platform as well as close the positions when you want. 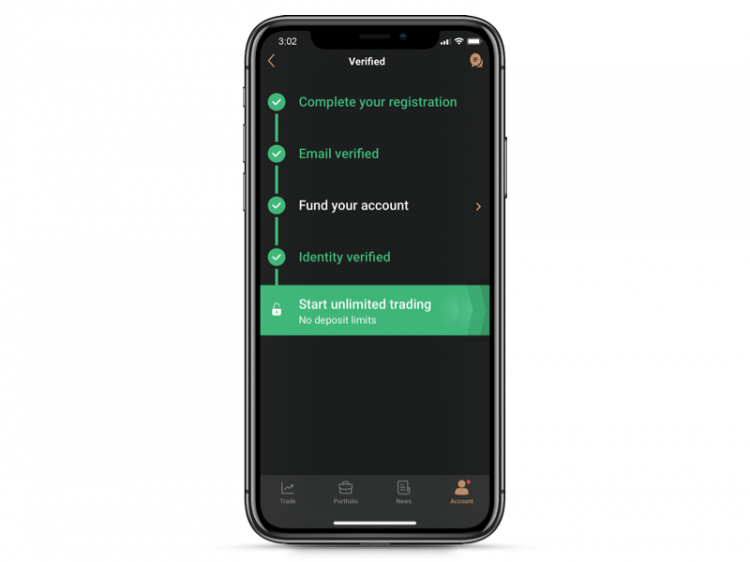 In the platform, you’re always offered two prices based on the value of the underlying instrument you are trading: the buy (bid) price and the sell (offer) price. The price to buy will always be higher than the current underlying value and the sell price will always be lower. The difference between these prices is called the spread. When CFD trading, you’ll need to decide how many contracts you want to trade. Each market has its own minimum number of contracts. For instance, Brent crude oil has a minimum of 0.1 contracts to enter a trade. You can set up limit orders to automatically close out a position at a given profit level so you do not have to watch the market constantly. Limit orders also reduce the likelihood of holding onto a winning trade for too long, as emotion can take over and blind you of your initial expectations. Similarly you can place stop-losses to restrict your potential losses. A stop-loss is the point at which a position is automatically closed out if the price of the security drops below the trader’s entry point. Stops and limits are crucial risk management tools and are strongly advised. If you make a trade and it is not going how you expected it to, Capital.com protects you from losing more than you initially invested. In order to keep positions open a trader must meet the maintenance margin requirement; the minimum value of funds needed to be kept in a margin account to cover any credit risks whilst trading. The value maintained in a margin account acts as collateral for credit. When a trader’s exposure is about to exceed the maintenance margin requirement, Capital.com notifies them via a ‘margin call’. This is where a trade will either need to top up their balance or close some of their positions. If they do not act, their positions will be automatically closed if the close out level is reached. Capital.com’s platform is powered by Artificial Intelligence. 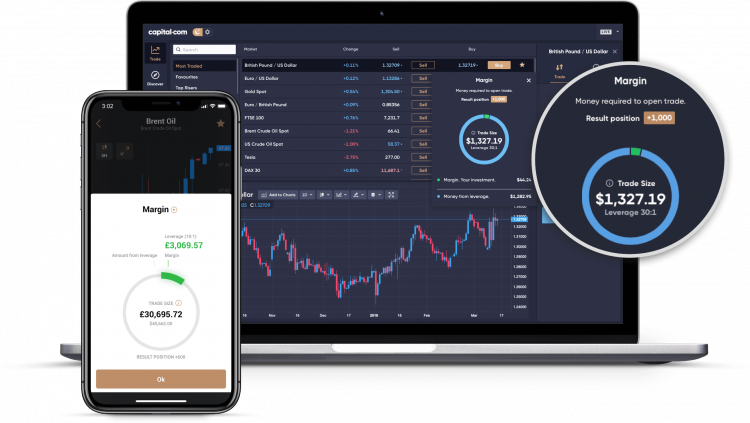 Behaviour analysis tools are embedded within the platform that tailor relevant articles, videos, news and analysis to the trader. This relevant content is presented is presented in a slick and comprehensive feed. Furthermore, AI solutions will be provided if the behaviour analysis tools identify any biases that the trader may be subject to.